Sodium Bifluoride is a highly toxic, corrosive chemicals, poisonous. Avoid contact with eyes, skin and clothing. Keep the product in air tight bags. In case of contact with eyes and skin, wash the affected place with running water. 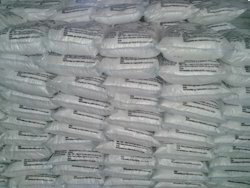 Sodium Bi Fluoride has white free flowing powder appearance with high solubility in water. As an inorganic compound with formula NaHF2, its a salt of sodium cation (Na+) and bifluoride anion (HF2-) that decomposes upon heating. Being non-flammable as well as having pungent smell, it finds applications as cleaning agents and laundry sours. Apart from this, it is also used in process used for plating metal cans. Further, this compound also supports enhancing corrosion resistance of some magnesium alloys. % NaHF2 98.50 % Min. % HF 30.00 % Min. % Fluorine as F 59.65 % Min. % Moisture(@ 100 OC) : 00.50 % Max. % Iron as Fe2O3 00.05 % Max. % Water insoluble 00.30% Max. 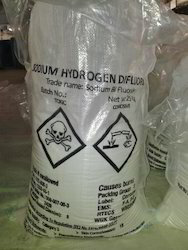 Potassium Bifluoride is a toxic chemical poisonous. Since the product contains 25% free HF care should be taken to avoid contact with eyes, skin and clothing. Aq. Solution corrodes glass. Keep the product in air tight bags.